The main purpose of Xavier's School for Gifted Youngsters (and later the Jean Grey School for Higher Learning) seems to be to teach mutants to use their powers. Does the school also teach "normal" school subjects, like mathematics, history, language arts, or science? Would a mutant at this school ever learn stuff like algebra or physics? I'm interested in the main Marvel comics line (Earth-616, or whatever it calls itself these days), although other universes or media would be interesting supplementary information. I think it was (at least occasionally) implied that they do. In X-Men 168 (am I showing my age here?) a temporarily demoted (from X-Men to New Mutans) Kitty Pryde angrily wonders how she "can do any work without the proper lesson programs" for her computer. Context (e.g. that she is in her room, not in the danger room) suggests that this is homework rather than some sort of training for her powers. In the same issue she has dancing lessons together with Illyana (Magik), so "normal" stuff is at least approved of by Xavier. The first three X-Men movies show scenes of children getting taught regular subjects. These include Prof. X teaching a (presumably) English Lit class about The Once and Future King, and in the first film Prof. X dolling out (what I think is) physics homework. There is also a scene of Storm teaching a class in this video. You can't hear what's being said as it's been over-dubbed with music, but can see what is probably the word "Romance" on the board so again, maybe an English Lit lesson. While it's possible that he means they completed such a curriculum prior to coming to Xavier's, it wouldn't make sense for him to be providing a diploma covering such if that were the case. No, the school does not teach normal subjects. In X-Men #1 in the 1960s, Iceman is reported to be 16 years old and it's implied that he is the "baby" of the group, i.e. the youngest. All of the (original) team were of an age to have completed a normal High School education. The "school" is a fake, designed to give the appearance to outsiders of being an ordinary college for High School graduates, but this is only camouflage. It in fact acts as a haven for the team members, where they're trained to use their superpowers to best effect. It's also their headquarters. 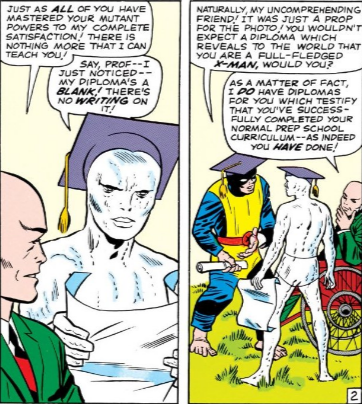 But Professor X never claims to be qualified to teach ordinary courses, and Jack Kirby never shows the team in an actual classroom. Not the answer you're looking for? Browse other questions tagged marvel comics x-men or ask your own question. Does Hogwarts teach non magical classes? What is the status of the Xavier Institute for Higher Learning's accreditation? What does Beast use Pym particles for? Why does Quicksilver hold Magneto's head, but not everyone at Xavier's school? Where does Charles Xavier's seizure power come from? How does Peter Parker get to school? 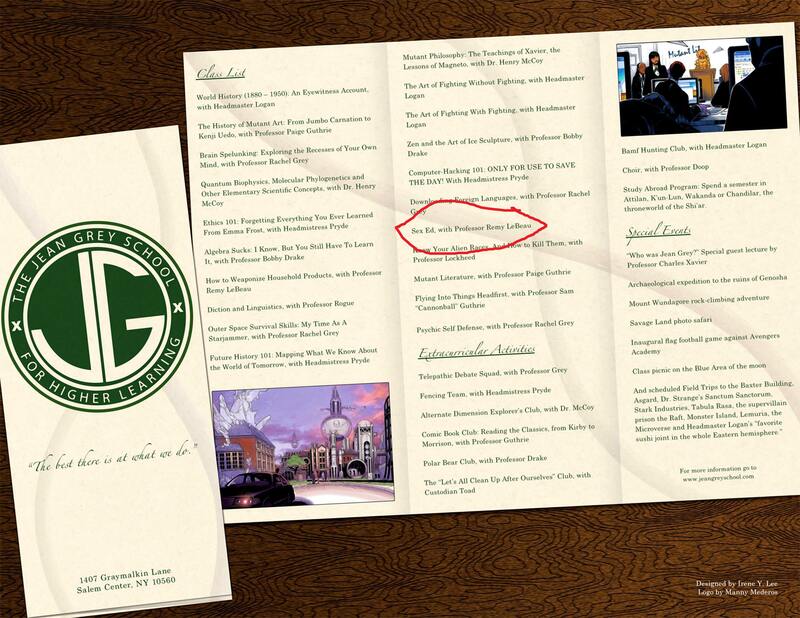 Why was 1407 Graymalkin Lane chosen as the address for Xavier's Mansion?